Hope you've all had a great day! I really haven't been feeling well today so this post is a bit of a struggle, but worth it! The polish I have to show you today is my first offering from the Cult Nails Divas and Drama Collection. 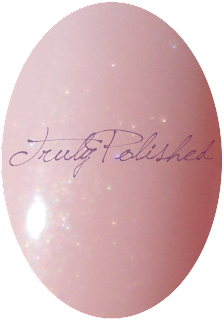 Enticing is a very sheer pink polish with a subtle shimmer. The formula on this was really good, it took four coats to get the coverage you can see in my photos and I still had a visible nail line, but that's what you get with such a sheer polish. 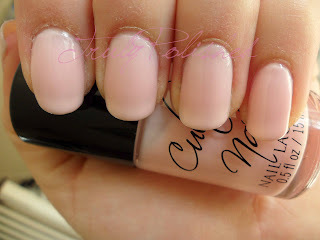 The reason I reviewed this polish first is because I wasn't sure I'd like it but I actually LOVE it! It's so girly and the pale pink is really good for all occasions! Now on to some photos! As I said before, all of these show 4 coats, I didn't use topcoat because just like all Cult Nails polishes, this dried super shiny! Macro, look at that shimmer! I bought this polish during the pre-order period when I got the whole collection for $30 but now you can buy Enticing here for $10. The blue is gorgeous! I think that's what I'm going to post today! I wasn't sure about the orange but in person it looks a lot more subtle! Hope you like your polishes when you get to try them!